This Irish baby blanket could be used for the homecoming from the hospital. 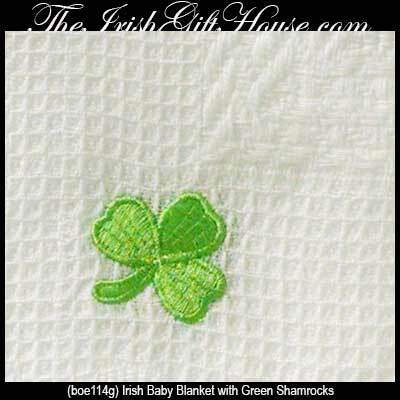 Each corner of this Irish baby blanket features an embroidered appliqué green shamrock. 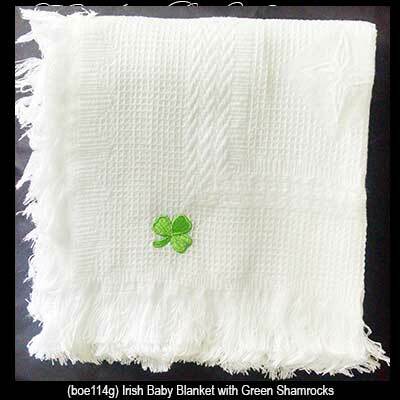 The soft shamrock baby blanket is 100% white acrylic and measures 48” wide x 48” long. This Irish blanket is received with a shamrock history card, complements of The Irish Gift House. Please note that hand washing is recommended for this imported blanket.